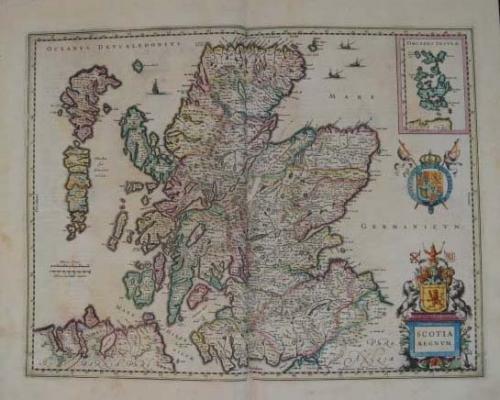 Title: 'Scotia Regnum', Dutch edition, Amsterdam, 1645 A.D.
A fine decorative map of Scotland decorated with two armorials and an inset of the Orkneys. The map contain the towns of Edinburgh, Aberdeen and Glasgow. In very good condition, light overall toning, old-restored spot (3,5 cm) at the lower centerfold that just crosses into the map border.